The German steel-making group’s turnaround has sputtered: shares are down 35 pct in a year and the outlook is tepid. A better corporate structure could create new oomph. A full-blown breakup may be tricky, but fellow Essen resident RWE’s spinoff plans may work for Thyssen too. A worker controls a tapping of a blast furnace at Europe's largest steel factory of Germany's industrial conglomerate ThyssenKrupp AG in the western German city of Duisburg. ThyssenKrupp Chief Executive Heinrich Hiesinger warned shareholders on Jan. 29 that the situation on steel markets was grim and could have an impact on the German industrial group’s guidance. 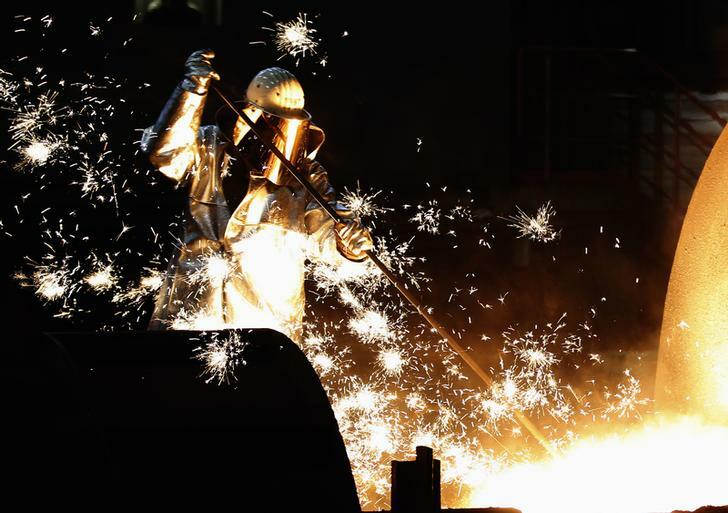 “The start of the current fiscal year has seen a considerable deterioration in the materials markets,” he said at ThyssenKrupp’s annual general meeting. He added that the company’s guidance for the fiscal year through September hinged on a clear recovery of materials markets in the fiscal second half. Thyssenkrupp has forecast operating profit in a wide range of 1.6 billion euros to 1.9 billion euros ($1.7 billion to $2.1 billion) for the current financial year to the end of September, against 1.68 billion euros in 2014/15. Two influential shareholders on Jan. 28 urged the company not to pay a dividend, but to strengthen its balance sheet instead.